The horsepower wars are on, the full-size SUV is back, and station wagons might be rolling towards a well-deserved comeback. The New York International Auto Show was the last event on the annual auto show circuit and hit Manhattan right around the time the last crusty vestiges of snow and ice melted into spring. The annual gathering of automotive debuts, reveals and North American firsts let consumers from in and around the greater New York megalopolis get an eyeful and hands-on experience with the latest and greatest from the motoring universe. Fuel Curve was there and happy to report more horsepower, more technology, and more performance choices than ever. Presented here in no particular order of preference or desire are a selection of what was new and what caught our eye at least 11 times at the 2017 NYIAS. As the vast majority of the SUV driving public will never go so far off road as a groomed gravel driveway, the Jeep Grand Cherokee Trackhawk is a 700-plus horsepower all-wheel drive road assault SUV that makes as much if not more sense than the dedicated drag racing Dodge Demon. Why wait around for an all-wheel drive Hellcat when the Trackhawk is calling you to drive a Jeep? The Trackhawk is the strongest and quickest Grand Cherokee ever with a supercharged 6.2-liter V-8 rated at 707 horsepower and 645 lb.-ft. of torque backed up by an upgraded TorqueFlite eight-speed automatic transmission and driveline components engineered to channel boosted twist to all four 20×10-inch wheels. The Trackhawk will hit 0-60 mph in 3.5 seconds and click off a quarter mile in 11.6 seconds. Top speed is 180 mph thanks in part to functional aero. Quadra-Trac on-demand four-wheel-drive has come a very long way since 1973, with 5-mode Selec-Track system and Bilstein adaptive damping suspension backed up by the largest front brake package ever installed on a Jeep. The Brembo binders slow the Trackhawk from 60-0 mph in 114 feet. The Trackhawk runs nearly 12 pounds of boost through its intercooled supercharger and the Quadra-Trac four-is-better theme sounds off through quad tips on a tuned exhaust. The performance hive mind at SRT has done it again and the Trackhawk carries on a tradition of unbridled Jeep road performance set in motion with the SRT Grand Cherokee back in 2005. Kia announced a new Rio sedan and 5-door (say hatchback) in New York and brought along the new Kia Stinger that made its debut back in January at the Detroit Auto Show. The last time we saw a Kia Stinger at the New York Auto show was the 2-door GT4 Stinger concept back in 2014. While that concept has yet to see production the long wheelbase Kia Stinger 4-door is on deck and ready to hit the road this year. The big Stinger is available with either a 2.0-liter turbocharged 4-cylinder Theta II good for 255 horsepower at 6,200 rpm and 260 lb-ft of torque or a 3.3-liter twin-turbo V6 Lambda II engine rated at 365 horsepower at 6,000 rpm and 376 lb-ft of torque. Both engines are backed up by an 8-speed paddle shift automatic transmission churning either torque-vectoring all-wheel drive or rear-wheel drive thankfully equipped with a mechanical limited-slip differential. Selecting the V6 setup brings along a staggered width wheel and tire package with standard Brembo brakes. Style from the KIA Design studio in Frankfurt is supported by a gran turismo tuned chassis and suspension from Albert Biermann who joined forces with KIA in 2014 after his tenure at BMW. We’re saddened not to see the GT4 concept in production form but hoping KIA adds more roof to the Stinger and joins Porsche, Mercedes, and Buick at the station wagon high-performance saloon party. The Toyota FT-X concept is a rugged and stylish compact SUV targeted towards younger residents of the megalopolis that occasionally want to get away from it all for low-key camping or connected glamping but are wholly disinterested in embarking on any full-tilt overland expeditions. Selectable 4WD with low range and MacPherson strut independent suspension provide Toyota off-road capability without the body-on-frame truck ride. Small displacement was the only clue on engine potential on this crossover. The FT-X is a product of the Toyota Calty Design Research in California and features a Multi-Hatch rear door side hinged for urban operation and top hinged for casual camping or impromptu tailgating. A myriad of tools and features in the cabin includes crucial power and charging ports, hot and cold storage boxes, sleeping bag, removable flashlight, and a handy selection of grab bars. Tunes are available inside and out with an in-dash pull-out portable sound system with boombox-style handle grip. Retro styling can be at once refreshing and at the same time perilous as nostalgia does not always translate into ongoing sales yet the last Toyota SUV that went retro is probably in greater demand now than when it was on sale, so this shrunken interpretation of the FJ Cruiser might just make it into production. And while we’re not sure what exactly the casualcore moniker in the FT-X press materials means, a quick search brought up images of the FT-X and a few pairs of 70s-style NBA-branded tube socks. Horsepower wars and resulting high-performance luxury motoring are not exclusive to internal combustion power sources. To that end, Lucid Motors made its global auto show debut in New York with their executive-class ultra-high performance all-electric 1,000 horsepower twin-power Lucid Air. Unconstrained by the space parameters of internal combustion engines, the Lucid Air delivers full-size interior appointments with a mid-size automobile. The future of luxury class mobility was well-represented by a road-going Lucid Air production prototype and Alpha Speed test car fresh from torturous high-speed stability testing in Ohio where it achieved a software limited 217 mph on the banked track. While the Alpha Speed test car proudly wore layers of racer tape, tire marbles and 200-plus miles per hour worth of bugs and atmospheric track debris, the road-going Lucid Air prototype was formally dressed for its New York reveal. With its expansive glass roof and jet age interior appointments inspired by luxury air travel, the Lucid Air might finally deliver on the automatic bubble top motoring experience under the crystal clear skies on the highways of the future promised by the mid-century General Motors Autorama. The dual electric motor thousand-horsepower propulsion enables the Lucid Air to travel from zero to 60 miles per hour in a futuristic 2.5-seconds. Purists will likely balk and squirm at the very idea of a Panamera or Porsche wagon of any kind but we’re looking at the Panamera Sport Turismo long roof with rose-colored throwback glasses from the driver’s seat of a 1971 Lamborghini Espada and giving the new Porsche a New York-style howyadoin nod of approval from the other lane. If the SUV is a tall roof and the CUV a round roof, the Porsche Panamera wagon fits solidly into the long roof category. The 5-passenger Porsche wagon will be available in four different versions for the United States and the huge greater New York and New Jersey markets. The Panamera 4 packs a 330-horsepower turbo V6 and the 4S ups the wagon game with a twin-turbocharged V6 with 440 horsepower for a launch controlled 4-second flat 0-60 mile per hour time. The Panamera 4 E-Hybrid Sport Turismo combines the 4S-specification internal combustion engine with a 136-horsepower electric motor. At the top of the lineup is the Panamera Turbo Sport Turismo equipped with the 4-liter twin-turbo V8 rated at 550 horsepower. The large tailgate with low loading edge brings increased luggage compartment volume to the Panamera Sport Turismo that is slated for availability this fall. Even as crossover utility vehicle popularity continues unabated, the new Lincoln Navigator made its debut at the New York Auto show with the message that the full-size SUV is back and loaded with what Lincoln called quiet luxury. The big Lincoln is powered by a twin-turbo V6 engine slated for 450 horsepower and backed up by a 10-speed automatic transmission for nearly imperceptible shifts. Extensive use of aluminum alloy in the Navigator body added strength and saved 200 pounds. Laminated side glass helps the Lincoln deliver on its quiet promise and the expansive glass moonroof sheds plenty of natural light on what Lincoln rightly refers to as “ultra-luxury” in the cabin. Pickup and delivery, Alexa integration and connectivity, heads-up instrumentation display, a 20-speaker hi-fi sound system and available chauffeur service encapsulate the Navigator blend of luxury and technology. As the CUV-class that arose as the compact offspring of a station wagon and full-size SUVs have grown as large or larger than many of their full-size SUV predecessors, the return of the Lincoln Navigator two decades out from its 1997 introduction makes perfect sense. We’re hoping to hand out a Fuel Curve Award of Excellence to the first hearty soul that installs a Ford Raptor suspension complete with an upgraded wheel and tire package up under the new Lincoln Navigator and helps it locate a sweet jump for luxurious air time. Mercedes-Benz rolled out an automobile from a possible future and celebrated its ongoing performance heritage in wagon form in conjunction with the 50th Anniversary of Mercedes-AMG. Bringing together a modular battery and rear-mounted electric propulsion with traditional V-8 power and sound was the Mercedes-AMG GT Concept. The EQ Power system combines dual sources of available power for a theoretical 860 horsepower and potential 0-62 mile per hour time of less than 3-seconds. The four-door coupe embraces hybridization as a possible future for the AMG GT family. Since the rumble of a V8 will likely be part of the automotive performance experience for at least one more generation, the Mercedes-AMG E63 S Wagon made its U.S. premiere after bowing in Geneva. The sport wagon is powered by the latest iteration of the AMG 4.0L biturbo V8 engine hand-crafted to deliver 603 horsepower through the AMG Performance 4MATIC+ all-wheel drive system and down onto the road for a class record-setting acceleration from 0 to 60 mph in 3.4 seconds. Cylinder deactivation adds a measure of efficiency to the exclusively luxurious experience. Two turbos, all-wheel drive and over 600 horsepower make this wagon the one to get for those with money and rubber to burn. Honda introduced its triumvirate of Clarity alternative fuel automobiles in New York but our twitchy eye was transfixed on the Civic R-Type and its promise of the fastest and most powerful Honda ever sold in America. After two decades of desire and envy directed towards a Civic Type R that was available everywhere but here, the ultimate production performance Civic has arrived on the 10th generation Civic platform. The 5-door hatchback packs 306 turbocharged and intercooled horsepower and 296 lb-ft of torque backed up by a 6-speed manual transmission with rev-matching that churns the front wheels through a helical limited-slip differential. No automatic transmission of any kind is available. The Civic body was factory stiffened and reinforced with high-strength steel from the inside out and the stronger unit body comes equipped with tuned suspension and Brembo brakes to handle the power from the American-built direct-injected 2.0-liter DOHC 4-cylinder engine. An aluminum hood sheds weight. Bolstered front seats and a leather-wrapped steering wheel work with 3-mode control for Comfort, Sport and +R driver entertainment. Polarizing design accented by functional aerodynamics combined with a turbocharged departure from a Honda tradition of high-revving aspirated engines have added purist grumbling to the long-awaited arrival of the Honda Civic Type R, even if all that will likely be forgotten over a rev-matching triple exhaust tip soundtrack. Volvo marked its 90th year of automotive excellence with the all-new Volvo XC60 as the latest iteration of the mid-size SUV that Volvo introduced in 2008, which made its North American debut at the New York Auto show. At the top of the new XC60 performance lineup is the twin-engine 400 horsepower XC60 T8 hybrid, shown here plugged in and perched above its historical tall wagon passenger estate PV445 Duett predecessor. An internal combustion T6 turbo-and-supercharged engine is set for 316 horsepower and the T5 turbo engine is tuned for 250 horsepower to the front or all wheels. The luxurious XC60 cabin is upholstered in ultra-supple Nappa leather with a standard panoramic roof that sheds light on a contemporary style of interior appointments. Thor’s Hammer LED headlamps illuminate the night sky and road ahead. A Sensus Connect Touchscreen interface accesses the Pilot Assist semi-autonomous driving system that enables the XC60 to drive itself on well-marked roads at highway speeds. Volvo has traveled a long road from its utilitarian wagons and lovable bricks. The rugged yet stylish vintage Scandinavian utility of the Volvo PV445 Duett on display in New York was a reminder that Volvo has been building capable midsize SUVs all along. The stars have spoken. The tires have smoked. The front wheels have left the ground. The Dodge Demon fired the latest salvo in the Detroit horsepower wars. An outright diabolical 840 horsepower and 770 lb-ft of torque from its supercharged 6.2-liter V-8 engine make the Dodge Challenger SRT Demon the most powerful production muscle car in the world – at least for now. The V-8 makes the number with 14.5 psi of liquid-to-air intercooled air and more fuel from twin dual-stage pumps feeding larger injectors. Factory production trans-brake and Torque Reserve system work with Nitto drag radials and Drag Mode Launch Assist for solid wheel hop-free launches. The drag race Demon will hit 0-60 mph in 2.3 seconds and click off a 9.65 second ET in the quarter mile at 140 miles per hour. Demon drivers are so advised to go for some sandbagging at their local Wednesday grudge night bracket drags unless they want the NHRA to request a roll cage install and license pass or two before they let you back out on the 1320. Flared fender wide-body treatment finishes out the Demon package and its superlative Dodge performance is backed by limited 3-year/36,000-mile vehicle and 5-year/60,000-mile powertrain coverage. Dodge Demon production will be limited to 3000 cars for America and 300 cars for Canada and every Demon buyer gets a full day of instruction Bob Bondurant School of High-performance Driving at no extra charge. From the company that manufactured one of the last of the full-size body on frame V-8 powered American station wagons with their mighty Buick Roadmaster comes a station wagon version of the modern Buick Regal known as the Tour X. The all-wheel drive wagon packs a 2.0-liter turbocharged four-cylinder engine produces 250 horsepower and 295 lb-ft of torque – just 10 horsepower shy of the 1996 Roadmaster V8 with half as many cylinders and less than half the displacement. The turbo four is backed up by an 8-speed automatic transmission that puts the twist to a twin-clutch AWD system. The Tour X version of the Buick wagon is packing more ride height than its production counterparts to handle adventure. 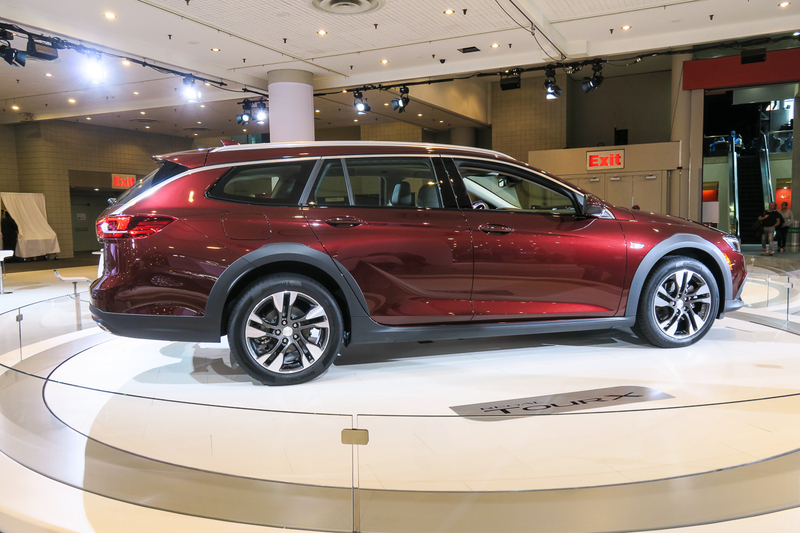 More station wagons are always a good thing and the Buick station wagon with outdoor sporting pretensions that hit New York will be joined on the showroom floor by as yet unspecified Preferred and Essence trim levels. We’re hoping Preferred is all in on Luxury grand touring and the Essence is all out on sport. We squinted our eyes and imagined the Tour X with plastic lower body cladding transformed into body color flares and matching ground effects kit with a tucked in wide wheel and tire package. Add some more boost to the turbo four and wagons ho! We’re also hoping Buick dips into its performance and muscle car cauldron of heritage and resurrects the Wildcat designation for a Regal Wildcat GSX wagon.